With a world flooded with compact home theater solutions, the latest and most succinct designs and technologies are making waves to provide a robust and convenient sound platform. By bringing new ultra-slim devices where speakers are condensed down into a base plate or a pad to support the flat screen of TV, both sonically and physically. Not requiring any mounting or rearranging; just slide the unit under your TV stand, and place your set right on top. 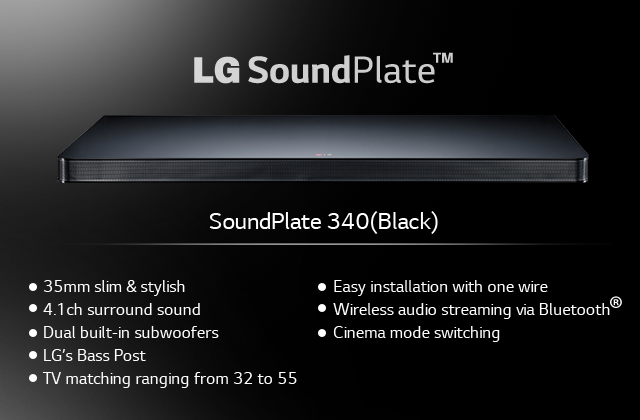 And one of the first and smallest of the class is the LG SoundPlate. 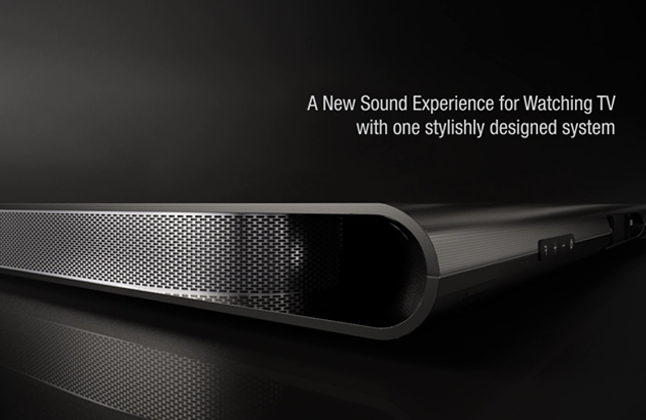 SoundPlate is a minimalist sound accessory form LG that’s an all-in-one sound package. If you look at the design, it is pretty chic & sleek with a solid built. The brilliant thing stands at a mere 35mm above its base, making for greater space efficiency in comparison to the big home theater systems. It has a robust 120 watt 4.1 audio channel with built-in dual 40 watt subwoofers, two 20 watt surround speakers and two 20 watt front speakers, which create a lush audio experience. The rear edge of the SoundPlate is curved and has a few buttons (volume controls, power and source selection). On the back it has an optical audio port, the power port and a toggle switch for auto power on/off. And it comes with a sleek 8-button remote. Hassle free installation: Can be wirelessly connected to a TV set or with the help of a single cable depending upon usage requirements. As compared to bulky home theaters that bring along a mess of wires. Brilliant surround sound and bass reproduction through LG Sound Plate’s cinema mode at the click of a button, enhancing the film watching experience. If you are looking for a minimalistic sound solution for your TV where you can avoid the mess of speaker wires around your TV along with a brilliant sound output, LG SoundPlate is certainly worth looking at. Designed keeping utmost simplicity and convenience in mind, the LG Sound Plate is truly an effortless and accessible, space liberating solution that delivers outstanding audio for a completely authentic home theater experience. Visit your nearest shop for a demo.